Amazon Kindle Store and on Google Play. An anthology of meditations. The inSpirit Series was previously known as the Meditation Manual Series. "This collection of reflections and aspirations invites us to listen to voices that have been silenced in the past. This kind of listening is vitally important to our religious movement. In order to create a beloved community-one that shares a powerful love and shapes a common purpose-we must know one another. In order to know one another, we must hear each other's stories, see the world through each other's eyes." 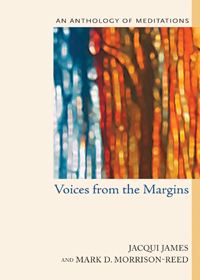 In Voices from the Margins, Jacqui James and Mark Morrison-Reed have compiled a remarkable collection of reflections and meditations from voices often left unheard in Unitarian Universalism. These writings remind us of both what we miss when we don't listen to marginalized voices and the amazing insights we stand to gain when we do. Saving Unitarian Universalism by John T. Crestwell Jr.
A Beautiful Assortment by John T. Crestwell Jr.
the sound of life coursing all around you."